The Wars of the Roses were a series of dynastic struggles set against a backdrop of extreme political upheaval and perpetrated by pretty much every character in William Shakespeare's historical plays. The exact time period is a matter of debate, since the 'Wars of the Roses' were not exactly measurable wars but rather a 19th century description of a period in England characterized by political strife and a feuding aristocracy. 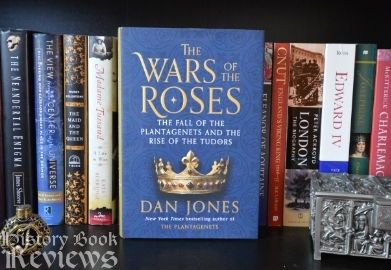 In his Wars of the Roses Dan Jones covers roughly the years 1420-1525, discussing the precursors and the aftermath of the "wars" and all the time between. This book was a very accessible work of history told with a friendly narrative, but I can't say that I was too blown away by it. Any historian of this subject can consider themselves lucky, because the historical facts of this period are so exciting and action-packed that any book written about it could be a best-seller. It's basically a combination of all of Shakespeare's historical plays, interweaving Henry IV, Henry V, Henry VI, Edward IV, Richard III, Henry VII, and all the crazy nobles and queens. Jones has done an admirable job introducing this tangled mess of characters and events, but overall his writing felt a little one-dimensional, as if he was just the outlet for this story rather than a storyteller or analytic historian. However, the historic figures can almost speak for themselves and Jones' writing still comes across as lively and factual. He certainly has a flair for descriptive (and sometimes over the top) adjectives, for example, describing Henry VI as a "defeated, world-weary shell of a thing prematurely ready for the grave" who fell into a sort of stupor, or a "crippling, vacant, catatonic insanity of a waking coma under whose grotesque spell he would remain for fifteen months". Ouch...perhaps Henry was just buried under all those adjectives. But the history and the people within it are fascinating, and this comes across well in The Wars of the Roses. We see the ex-Queen Catherine Valois hooking up with a groom to create the lineage that produced the Tudors, successfully using the Holy Relic of the foreskin of the Holy Infant to protect her during childbirth. I guess it worked, but come on, really? At least it's the perfect gift to get your pregnant friend, if you can obtain it without causing a lawsuit. We witness some of the battles with the French for control of the French throne, and meet the unfortunate and utterly crazy French king Charles VI, who believed he was made of glass and was subjected to shock treatment (aka men in blackface jumping out at him from behind tapestries in his bedchamber) to make him take a bath. We watch Henry VI grow up, ruling England from the time he was nine months old, presiding over his first Parliament at two years old and throwing a "royal tantrum". We see the Yorkists assert their claim to the throne due to the total ineptitude of Henry VI, and this is sad but not without reason. 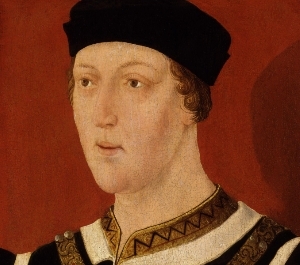 Poor Henry VI seemed to have been a total innocent, naive and kind and wholly unsuited for kingship. Jones tells us he made the warring nobles come to London in 1458 for something called "Love Day" (he's not joking, that's actually what it was called), where they had to make up and promenade across the city arm-in-arm with the person they hated most. A fine and well-intentioned diplomatic maneuver for a child, maybe, but disastrous in medieval England when dealing with battle-hardened aristocrats who can raise armies and overthrow kings when they're mad. Poor, innocent King Henry VI...Love Day, indeed. 1. When speaking of Edward IV's death, Jones suggests a few possible causes and then says: "We will never know." I feel like modern history books should take forensic science into account a little bit: Tell us where his body is, if it's still extant, what kinds of scientific testing could be done on his skeleton if it were permitted? I can't be the only one who wants to hear all the details about medieval corpses! 2. When speaking (very briefly) about Henry VIII, Jones describes his "increasingly monstrous sexual psychology". Gah! I don't have time to go into how stereotyped and, again, surface-level this judgement is, but suffice it to say that it made my eye twitch a little. Still, this would be a great book to start with if you want to introduce yourself to the Wars of the Roses. It is a mind-blowing period of history, more exciting than any fiction we could concoct, and this book will transmit that excitement and provide a perfect platform to jump from if you want to go deeper in the future.